Join us for a 70's & 80's party in Red Room, an exclusive stylish club in the cellar of Restaurant Comida at the Vienna Ringstraße. The cocktail bar and club concept combines elegant design with the highest quality in all its facets. 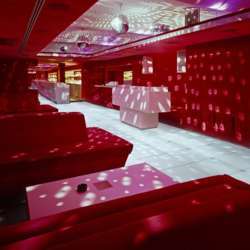 This bar has everything your heart desires: mirror elements, red seating, red velvet walls, white cubic elements, a lighted glass floor with moving light in different colors and a long bar with a sunken ice rink. We will enjoy our own DJ. Our dear Consul Axel will be on the turntables and spoil us with music of the 70's and 80's. Together we'll share some drinks at this stylish location to mix and mingle, expand your network, and spice up a chilly Thursday night. Feel free to bring also your friends, partners and colleagues along to celebrate the party with us and invite them to become part of our dynamic InterNations community. Last but not least, we need to remind all our members that an accurate guest list is important. Please be considerate and only register for this event if you really intend to come! In case you are not able to attend, then you are hereby kindly reminded to follow InterNations rules and cancel your online reservation at least 24 hours in advance. We are looking forward to a great night!